Abstract: A new avian taxon from the early Paleocene Waipara Greensand in Canterbury, New Zealand, is described. 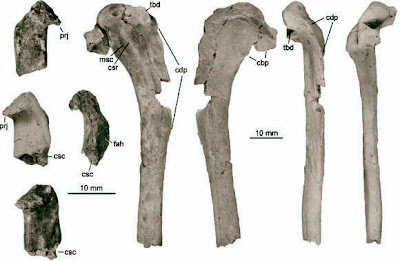 The holotype of Australornis lovei, gen. et sp. nov. includes wing and pectoral girdle bones, which exhibit distinctive morphologies. Notable features are a very long crista deltopectoralis, a craniocaudally flattened shaft, and a large tuberculum dorsale of the humerus, as well as a ridge-like caudal surface of the proximal ulna.